The intricate wicker design of the Spring Haven Patio Furniture Set is woven by hand using polyethylene resin wickers and powder coated frames to produce Weather-resistant furniture suitable for both outdoor and indoor use. Designer details abound in a four-piece outdoor set of intricately woven PE rattan in chic titanium grey. With cushions upholstered in sand all weather fabric, this set features transitional styling in a lounge, side chairs and ottoman with vanity panel. Outdoor entertaining doesn't need to be an oxymoron. 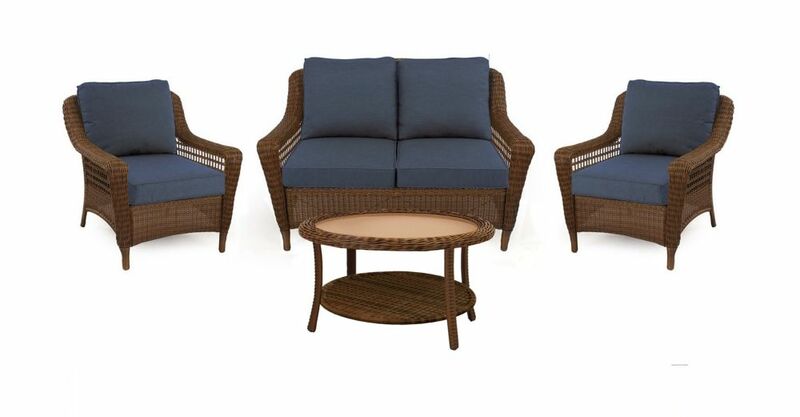 The Mojavi 4-piece wicker set brings casual elegance outdoors. Crafted of all-weather PE wicker in rich brown, and upholstered in beautiful, easy-care cream 100% Terylene, its clean lines and rich materiality make warm weather entertaining a breeze. This is a great addition to your home whether in the country side or busy city. Spring Haven 4-Piece Patio Conversation Set in Brown with Blue Cushions The intricate wicker design of the Spring Haven Patio Furniture Set is woven by hand using polyethylene resin wickers and powder coated frames to produce Weather-resistant furniture suitable for both outdoor and indoor use.